If you want to stay ahead of the trend and get your child the top toys of 2012, then a good place to start is with Let’s Rock Elmo! This is a toy so big it has even got its own comparison site. Let’s Rock Elmo is aimed at pre-school aged children and helps to learn through music and play. 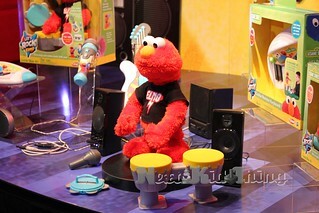 Elmo interacts with your child and recognises the instrument he’s been given such as drums or the tambourine (two instruments come included in the set.) Elmo will then rock out with the instrument and get your child to join in, too. You can also buy extra instruments and a bigger microphone as additions to the toy, providing you with good present ideas for the next birthday or special occasion! The second top children’s toy of 2012 is the LeapPad, a Learning Tablet for Kids. This is no surprise considering how techno-savvy children are at the moment. Most toddlers can work an iPhone nowadays and technology is taking front place in children’s learning. The LeapPad won 2012 Preschool Toy of the year, 2012 Educational Toy of the Year and overall 2012 Toy of the Year at the Toy of the Year Awards! It features a built in camera and video recorder, ultra e-books and a library of over 100 cartridges and apps. It’s designed for children aged 4-9. The Nerf Vortex Citron Blaster next, and whilst you’ve probably seen the adverts, nothing compares to the distance on this disc blaster. The rate of fire is great, making it a fun gift for any child who’s into their Nerf blasters. Now we have a firm favourite for boys and girls, the Avigo Chevrolet 12V Camaro. This is a battery operated miniature car, basically a child’s version of the GM Chevrolet Camaro. It’s quite large and can go up to 5mph so it’s no wonder children everywhere want this gift! It features an MP3 outlet, working FM radio, buttons with sound and two seats. Of course, something like this doesn’t come cheap, at about $300 US dollars per car. The fifth top children’s toy of 2012 is the fantastic Air Hogs Hyperactive Pro Aero GX. This car is part of the Air Hogs racing car range which feature cars with the ability to upright themselves meaning more racing for your children! Especially popular with boys, these remote control cars allows you to perform and perfect racing tricks as well as looking pretty cool, too. This article is written by Rose who wants to help find the best toys out there for children and find out more about pregnancy across the world.